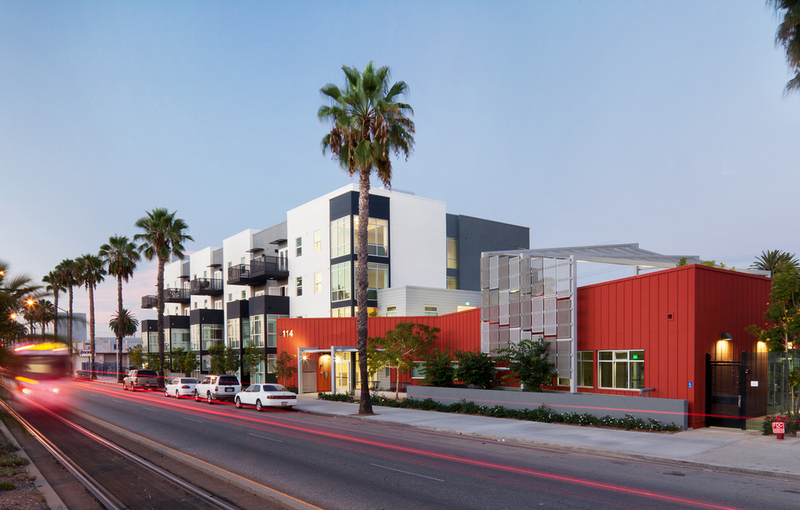 The Long Beach and 21st Apartments are located on Long Beach Blvd., a busy thoroughfare where the Metro Blue Line runs down the median, enabling residents to conveniently access public transportation. The aim of the project is to provide a safe, decent home and onsite supportive services seven days / week. The program includes 41 units of senior affordable housing with 15 units set aside for homeless and 6 units set aside for people living with a qualifying disability. One of the design challenges was a construction budget constraint due to the lack of adequate funding relative to the ambition of the project. The solution was to concentrate the apartments into an efficient 4-story double-loaded corridor arrangement, with access to light and views on both ends, and to locate the key programmatic functions in an adjacent one-story volume. 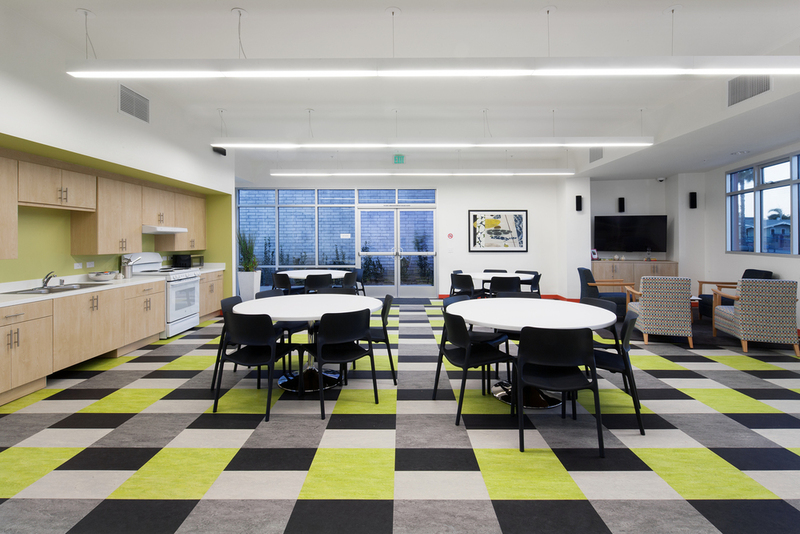 In addition to providing housing, the project facilitates the building of social ties among residents. 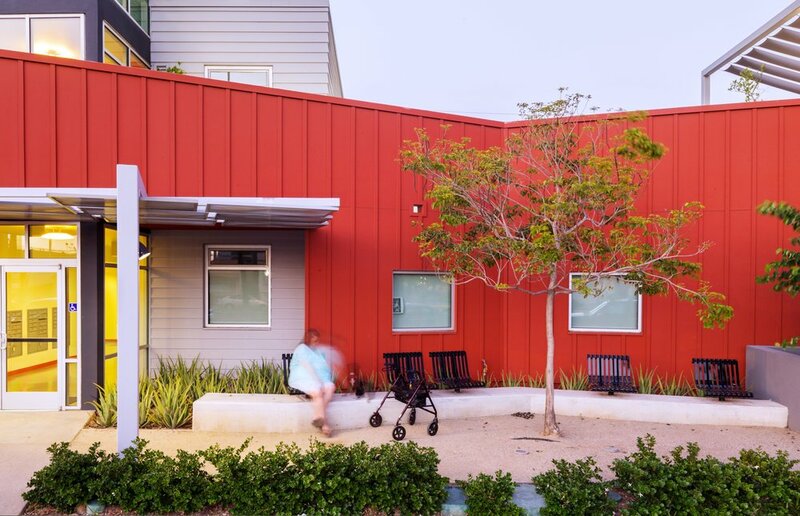 The concentrated footprint of the building, leaving half of the site open, created the opportunity to provide an on-site safe garden with a circuit walking path for the vulnerable population. A glazed tower marks the entry and pins the two parts of the building together. A garden with seating adjacent to the entry acts as a “front porch,” providing a place for residents to interact with neighbors. The backyard is a “car park,” or a park that includes cars, with a collection of distinctive trees that provide shade and obscure the parking, creating a serene atmosphere.